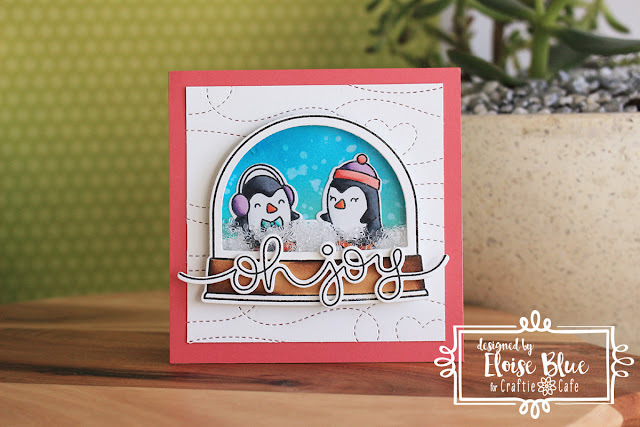 Hello everyone, today I'm back for Craftie Cafe and I have a card to share with you all using some Christmas Products from Lawn Fawn. I started off with stamping some images from Ready Set Snow, Snow Cool and a sentiment from Winter Big Scripty Words. I then coloured my images in with Copic Markers and cut them out using the coordinating dies. I then cut an additional backer for my globe, and coloured it using Salty Ocean and Cracked Pistachio Distress Oxide Inks. I want to make this snow globe a shaker, so I made sure to use the shaker add on dies so that the snow globe was open, like a window. Once the inside was cut I adhered down a piece of acetate on the back. I then added two layers of foam tape around the perimeter of the snow globe and filled it with seed beads. Before closing up my shaker, I added the snowy piece onto the coloured backer snow globe as well as the two penguins. I then added the backer onto the back of the snow globe shaker piece to seal it up. Next I cut down a piece of white cardstock to 3 1/2 x 3 1/2 inches and used the Stitched Trails to emboss some stitched lines on the background to give it a little interest. 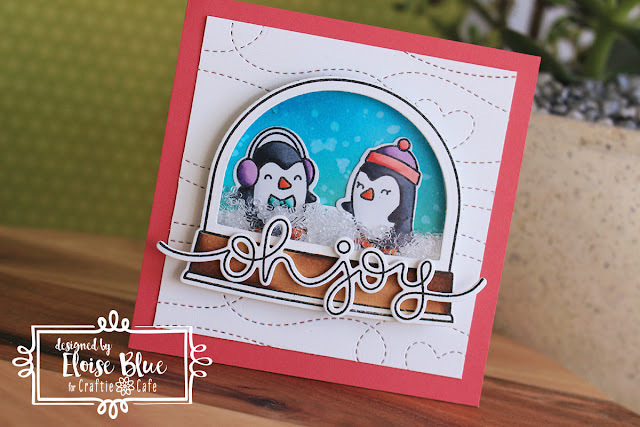 To finish up my card, I adhered my sentiment 'Oh Joy' from the Winter Big Scripty Words to the bottom of my snow globe. Then to put my card together, I added a piece of Guava cardstock from Lawn Fawn onto a 4" x 4" card base, then adhered on my stitched piece and then my main focal snow globe on top and that finished up my card for today. Thanks so much for stopping by and I'll catch you next time!